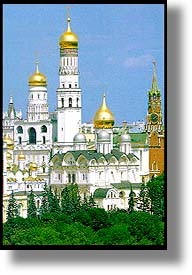 The Kremlin is Russia's mythic refuge, a self contained city with a multitude of palaces, armories, and churches, a medieval fortress that links the modern nation to its legendary past in the ancient state of Kievan Rus'. As the dominance of Kiev faded and its empire fragmented under the weight of foreign invasion and internecine strife in the 11th and 12th centuries, regional princes gained power. In 1147, as Kievan Rus was experiencing its final death throes, a chronicler recorded that a feast was held at the hunting lodge of Prince Yuri Dolgorukiy, ruling prince of Rostov and Suzdal. The lodge was perfectly situated atop a hill overlooking the Moskva and Neglina rivers, prompting its development (in such troubled times) as a fortified town, or Kremlin. The Kremlin Arsenal was commissioned by Peter the Great to serve as a weapons depot and manufactory. After Napoleon's disastrous retreat from Moscow this building became a museum commemorating the Russian victory. Most of the cannons arrayed along its side were captured from the fleeing, tattered remains of Bonaparte's Grande Armee. The Arsenal is now the headquarters of the Kremlin Guard. This modern glass and concrete structure, completed in 1961, is the Kremlin's most recent edifice. It was built during the halcyon days of the Khruschev administration to host Communist Party congresses and was executed in appropriately magnificent style. The palace's most prominent feature was its huge auditorium (6000 seats), the stage of which was surmounted by a monumental bas-relief head of Lenin surrounded by gilded rays. Today the palace is used for performances by the Kremlin Ballet Company, and the once familiar relief of Lenin is gone. The graceful neoclassical Senate building, commissioned by Catherine the Great, is one of several fine works in Moscow by the architect Matvey Kazakov. The building was intended by Catherine to serve as a meeting place for an advisory council, but it is better known for having been the location of Lenin's office after the Revolution. In a recent modernization, however, his preserved offices were delivered into posterity. Today, the Senate serves as the official Presidential residence. These two curiosities form an oddly appropriate pair. Both are among the largest of their kind in the world, and neither has ever worked. The 40-ton Tsar Cannon, built during the reign of Ivan the Terrible's imbecilic son Fyodor in 1586, possesses a barrel in excess of five meters long and a calibre of 890 mm. The gun should in theory have been capable of smiting foolish attackers with projectiles the size of wine casks. As if the cannon's sheer size were not inspiring enough, the barrel and carriage are adorned with a relief of the redoubtable Fyodor as well as a scene in which a fierce Russian lion devastates a snake symbolizing Russia's enemies. If one thinks of Russia as a traditional matryoska doll, with Moscow contained within the country and the Kremlin similarly nested inside Moscow, then Cathedral Square is the final solid figure contained within the Kremlin. Laid out as the city's first great public space during the ascension of Muscovite power in the early 14th century, Cathedral Square was for centuries the symbolic heart of Tsarist rule. The square is centered on the impressive Cathedral of the Assumption, built in the 1470s by Ivan the Great as the seat of the Russian Orthodox Church. Until Peter the Great moved his capital from Moscow to St. Petersburg in 1710, Cathedral Square was the focal point of political power in the country--coronations, assemblies of the nobility, and all of the associated ceremonial rituals of state took place here. If one ignores the statue of Lenin that still looks out across the square from its eastern edge, Cathedral Square provides an unparalleled atmosphere of old tsarist Russia. Clustered around the square are a series of cathedrals, towers, and palaces that together constitute almost the entire history of that period. Dominating not only Cathedral Square but the entire Kremlin is the gleaming gilt dome of the Ivan the Great Belltower, long the tallest structure in all of Russia. Constructed of bright white stone and soaring to a height of over eighty meters, the bell tower was begun in the early 16th century and completed in 1600, during the reign of Boris Godunov. In the adjacent belfrey hangs the massive 64-ton Resurrection Bell, dating from the nineteenth century. 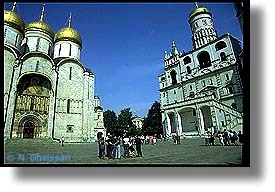 Assumption Cathedral is the oldest, largest, and most important of the Kremlin's many churches. It stands on the site of a small cathedral erected by Ivan I around 1330 to mark Moscow's new status as the seat of Russian orthodoxy. A century and a half later, Ivan III (the Great) decided that his predecessor's modest and by then time-worn work was insufficient as a symbol of the city's grandeur. After a brief and unsuccessful flirtation with local builders, he decided to go all out and hire an Italian (after all, it was the Renaissance). Thus, in 1475, Alberti (a.k.a. Aristotle) Fioravanti arrived from Bologna. After conducting a tour of Vladimir, Pskov, and Novgorod in order to gain a sense of the traditions of Russian ecclesiatical architecture, Fioravanti returned to Moscow and set to work. A mere four years later, he had finished a veritable tour de force, a cathedral so satisfying to his patron that Fioravanti's request to return to Italy prompted Ivan to imprison him. Fioravanti died in captivity a few years later. The Cathedral itself made history almost before the paint was dry, for it was on its steps in 1480 that Ivan tore up the charter binding Moscow's princes to tribute to the Mongols. In addition to its historical significance as the primary church of Russian Orthodoxy (and thus as the site of all manner of coronations, funerals, victory services, and intrigues), the Cathedral is notable for its accomplished architectural and decorative elements. Its frescoes, icons, and the elaborate Throne of Monomakh are of particular interest for visitors, as is Fioravanti's archetypal synthesis of traditional Russian ecclesiastical architecture. This comparatively modest structure was built by Russian craftsmen just a few years after the completion of the Cathedral of the Assumption. It now houses a fascinating collection of wooden figures. This most Italianate of the Kremlin's churches, the last of Ivan the Great's contributions to Cathedral Square, is the burial place of the early Tsars and their predecessors, the princes of Moscow. Commissioned in 1505 and built by the Venetian architect Alevisio, its notably foreign features include the scallop-shell decoration of its gables and the ornate Corinthian capitals of its columns. With the notable exception of Boris Godunov (buried at the Trinity Monastery of St. Sergei), the Cathedral houses the remains of everyone from Grand Prince Ivan Kalita (1325-41) to Tsar Ivan V (1682-96). Unfortunately, the tombs themselves do little to convey the passage of history, as all of the stone sarcophagi date from the 17th century and their bronze covers from the beginning of the twentieth. The golden-domed Cathedral of the Annunciation served as the private chapel of the Tsars. It was raised by Ivan III in the late 1440s on the foundations of a much earlier and more modest church and has been damaged, repaired, enlarged, and altered on numerous occasions since then. One addition deserving of special appreciation is the Grosnenskiy Porch, found at the Cathedral's southeast corner. The porch was built by Ivan the Terrible in 1572 after he contravened church doctrine by marrying for a fourth time (the Orthodox Church allowed only three marriages). While the Church Council appreciated Ivan's occasionally excessive reactions to opposition and thus accepted the marriage, it was able to express its dismay by asking the Tsar to refrain thereafter from entering the Cathedral to attend services. The porch was the resultant compromise, and from it Ivan would carry out his religious devotions from behind a specially-constructed grille. These two buildings are in fact a continuous structure, together constituting the Kremlin domain of the patriarchs of the Russian Orthodox Church. Constructed by the Patriarch Nikon in the 1650s, they now serve as a museum of 17th-century applied arts, including ecclesiastical regalia as well as furniture and domestic objects from the period. None of the three great palaces of the Kremlin are open to visitors--at least not yet. The earliest of the three is the Terem Palace, which is the oldest building in the Kremlin. The Palace served as the Imperial residence until the removal of the capital to St. Petersburg in 1712. The Faceted Palace, built by Ivan III, was used primarily for audiences and feasts, a function revived by Soviet leaders. The last of the three palaces, the Great Kremlin, was built in the early 19th-century as a Moscow residence for Nicholas I. All three of the palaces possess extraordinary interior decorations belied by their rather unremarkable exteriors. The Armory began in the early 16th century as a purely functional storehouse for the Kremlin's weaponry. However, within a few decades that original and prosaic structure had gained the added function of a workshop and repository for all sorts of treasures of the increasingly magnificent Imperial court. In 1813, following Napoleon's invasion, the Armory building became an exhibition hall and museum, though the Imperial arms and regalia had long since been removed by Peter the Great to St. Petersburg. It was only in 1851 that the collection was returned to Moscow, where it was installed in the current building, then new. Despite the loss of significant items in the collection during the early nineteenth century, the treasures contained within the Armory are overwhelming. From the chalice of Yuri Dolgoruky and the helm and armor of Boris Godunov to a stupendous collection of over fifty Faberge eggs, visitors are presented with an array of objects that is staggering in its historical interest and spectacular richness. Next door, at the Diamond Treasury, visitors can catch a glimpse of the infamous 190-carat Orlov Diamond.